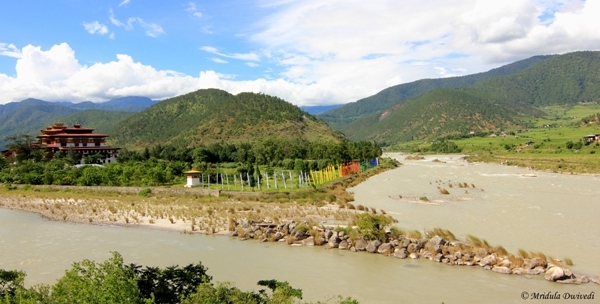 Punakha used to be the capital of Bhutan till 1955, after which it was moved to Thimphu. I have fallen head over heels for Butan. 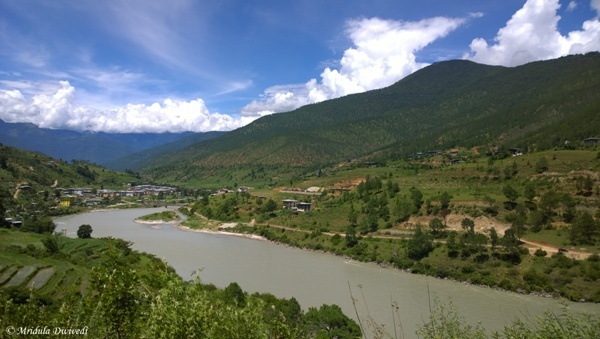 I visited Paro, Thimphu and Punakha (with Makemytrip on invitation) and while I would not like to make comparisons but Punakha is surely a lovely place, not to be missed. Indian nationals do not need a permit to visit Paro or Thimphu but we do need a permit to visit Punakha, Bhutan. As of now they are also doing road repairs on this stretch which makes the journey quite long. But Punakha, for that matter Paro as well, are exactly what a doctor would prescribe for city frayed nerves. They are a tonic to the eyes! We did Punakha as a day trip, which is not the best way to do it. If I had more time, I would stay there for a night at least. I would also love to walk around the place. This time, we would go past stunningly beautiful scenery in the bus, me drooling and feeling irritated at the same time. Drooling because almost every bend and curve would bring forth something beautiful, and irritated because I could capture it only as a blur. I then learned the trick to pre-focus my cell phone camera and release the shutter at the right moment. That is how I clicked the above picture, from the moving bus. But before that came the beautiful Dochula Pass, which is on the Thimphu Punakha road. On a clear day it offers a view of the high Himalayan peaks. But then I have not had a clear day in the mountains since the last trek in Nepal. So, I am not complaining. 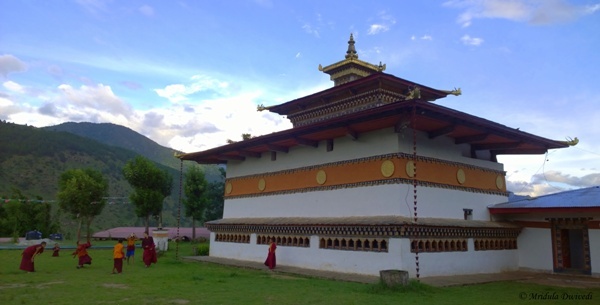 There are 108 chortens in this complaex which were commissioned by the queen mother, Her Majesty Ashi Dorji Wangmo Wangchuk. If you have a night stay in Punakha you would like to spend some time here. For us it was a quick stop as we were coming back from Punakha the same day. When we reached Punakha it was already lunch time. We had lunch at the Damchen Resort in Punakha. They make really good Indian food. When asked for their secret they said the chef was Indian. 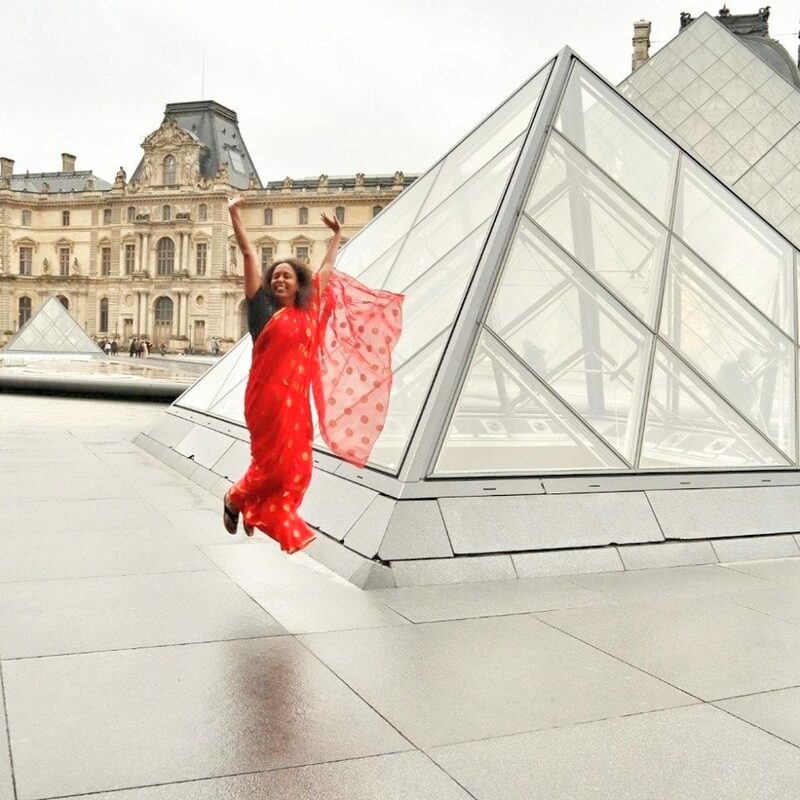 The lady manager worked with the Oberoi Group in Kolkata for an year before turning back to her native Punahka. Many Bhutanese study and work in India and then turn back to Bhutan. Afetr lunch we visited the grand Punakha Dzong. Built in 1637. It has seen coronations and weddings of the kings of Bhutan. It is built on a grand scale and is truly impressive. They have a strange ritual at the Dzong. They throw out water from the high towers and if are not careful you might get caught in the downpour. Our guide Raju ji explained that they have to throw out water collected in the morning by the evening. It contains grains as well which birds eat. A few tourists actually got the blessings when the water was thrown out. 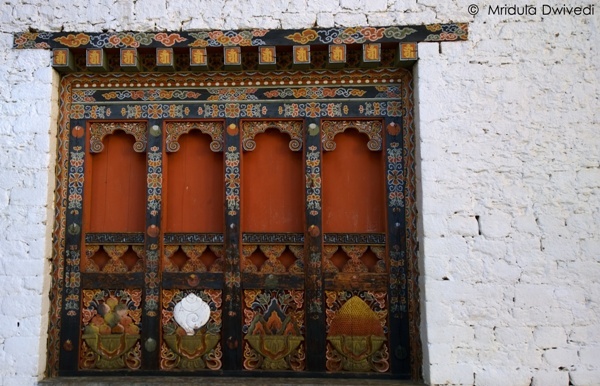 If you are into architecture you will find the Dzong full of little treasures, be it the paintings, doors, narrow staircases or the ornate windows. Photography is not allowed in the main prayer hall. The Dzong has witnessed fire in 1907 and flooding as recently as 1994. Raji ji pointed out that as the Dzong is connected from the main road only by a narrow wooden bridge in events of fire it becomes very difficult to do any rescue work. Our last stop in Punakha was the Chime Lhakhang Temple. It is devoted to the divine madman of Bhutan Lam Drukpa Kuenley. It is a fertility temple. The myth behind it was explained quite patiently to us by Raju ji but I found it quite difficult to comprehend. But I clearly remember that all of us sat quietly in the courtyard closing our eyes. There was a strong gust of wind, we could hear the birds twitter as well. Absent was any sound of traffic, and you know what a divine feeling it actually. When we opened our eyes Raju ji asked what could we hear. All of us heard different things, I did not go beyond the birds and the wind, some heard bells as well. Raju ji told us that if you heard a dog barking in this complex it was considered quite auspicious. The dog is connected to the myth. All of us laughed and told him that he should have let us know this before! Soon it was time to walk back from the temple to our parked minibus. The sun was heading towards the horizon leaving the entire valley awash in soft colors.